In our air compressor buyers guide, we’ll discuss the two main types of air compressors, their key traits, and the factors to consider before purchase. Rotary screw and reciprocating air compressors are two very common types of positive displacement compressors. Both can be found in a wide variety of applications and industries. There are however some differences between the two. It’s important to take some time to understand these differences and how they are best applied to your requirements. By doing so, you can make a wise investment in an efficient and reliable air compressor. 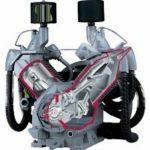 Reciprocating Air Compressors – Reciprocating compressors, also known as Piston compressors, can be found in variety of designs but most commonly are used in applications under 30hp. Also, when pressures over 150 psi are required a piston compressor would typically be used. Known for their durability in demanding applications, they can do well in a variety of industrial needs. They can be mounted on tanks or base mounted and driven by electric motors or gas engines. This flexibility also makes them an attractive option. The maintenance on a piston compressor should also be a consideration. Valves, piston rings and other parts normally require consistent routine maintenance. Rotary Screw Air Compressors – Rotary screw compressors can be very efficient and require less maintenance than piston compressors. These compressors are designed to perform best when a constant volume of compressed air is necessary at pressures up to 150 psi. Because of their dependability and long life cycles they are usually a great fit for standard plant air. Maintenance on a rotary screw is usually just filters and lubricant. With the use of sound dampening enclosures, noise levels can be dramatically less than that of a reciprocating compressor. After evaluating which type of compressor fits your application and requirements the best, you will then need to closely examine the factors that will help you find a quality compressor that will last and provide you with a good return on your investment. What are the pressure (PSI) and air flow (CFM) requirements? 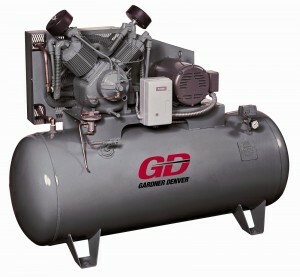 An overloaded compressor will not last so don’t under size your compressor requirements just to be cheap. Will the demand be constant or will it vary? Reciprocating compressors can run stop/start, load/unload or a combination of the two. How much storage (tank size) will be needed? Adequate storage can greatly reduce the load on your compressor. What is the quality of air required downstream? Extra treatment such as dryers and filtration may be necessary. Oil-Less reciprocating compressors are available if necessary. Warranty – Industrial Reciprocating compressors should be built to last, make sure that your investment is backed up by a solid warranty with local support for parts and service. 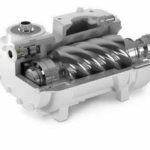 If you’ve decided that a rotary screw compressor is right for your requirements, how do you know what to look for in one and what differentiates the good from the not so good? Quality – the air end is the heart of your compressor, be sure it’s built with quality and backed by a long warranty. Make sure the manufacturer has a robust re-manufactured air end program available. Other system components should be scrutinized as well. Size and Serviceability – a small footprint is great, but make sure you can still easily service the compressor. Most packages can be offered with an integrated air dryer which can reduce space and piping requirements. Noise Levels – newer compressor designs and enclosures can reduce noise levels, allowing greater flexibility on installation locations. Cooling Method – will it be air cooled or water cooled? Considerations must be made on where the water will come from if it’s water cooled and how to deal with the ambient air conditions if it’s air cooled. Fixed Speed or Variable Speed – is your demand constant or does it vary? A variable speed compressor can offer considerable energy savings if your plant demand varies a lot. Control Systems – there is a huge variety of controllers in the market now that can control and monitor everything, but sometimes simplicity is better. Don’t over complicate things if you don’t have to. Take time to look at the controllers and make sure they are easy to use. Total Cost of Ownership – be sure to consider not only the purchase price but the maintenance costs and the energy cost to operate your compressor. Energy costs can account for over 80% of the total cost of ownership. Service & Support – a solid warranty backed up by local support for service and parts. Look for factory trained technicians that can fix your equipment quickly and professionally. We hope our air compressor buyers guide answered all you questions but if you still need help, contact us today. Whether you’re looking to purchase, repair or maintain air compressors, you’ve come to the right place. At Lewis Systems, we welcome the opportunity to be your partner in success.